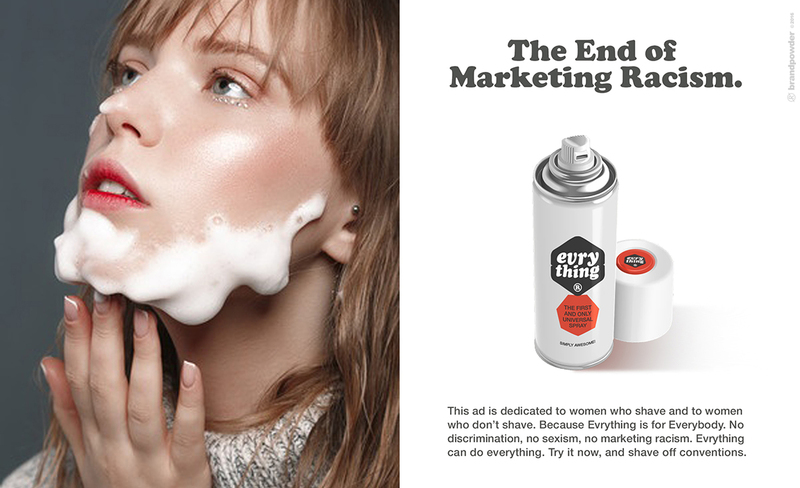 Advertising is trying to sell you all sort of stuff, and the more useless it is, the more indispensable it seems. So you keep buying hundreds of products that pile up in your house and, soon enough, you barely find a free square foot where to sit. This attitude usually degenerates into a disease called compulsive hoarding or disposophobia. You suffer from disposophobia when you accumulate every single thing without throwing what’s useless and even refusing to dispose of your own garbage; your house becomes a smelly, unhealthy ditch and rats start to infest your house. For this reason, disposophobic people are usually exposed to another disease: leptospirosis, which is quite unpleasant because you die. And that’s a pity, especially if your afterlife is spent in Hell. But hey! No worries. Your problems are now over! 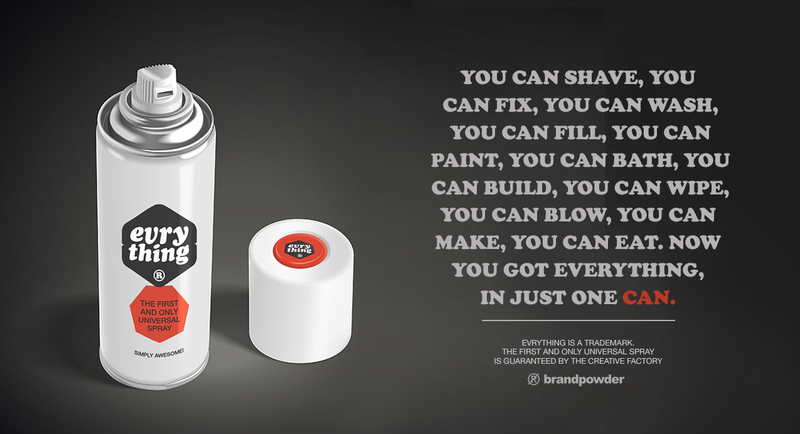 Brandpowder, in its noble attempt to avoid human decline and improve your life, even if you squander it in useless activities, developed a new product that is 500 into one. How can this be possible??? You may ask. Well, it’s possible when you invest five years in research and about 7.5 million dollars of your savings into something you believe in. The end result is something even beyond our expectations: we called it EVRYTHING®. The only thing missing in this great product is the second “E” in the word everything. 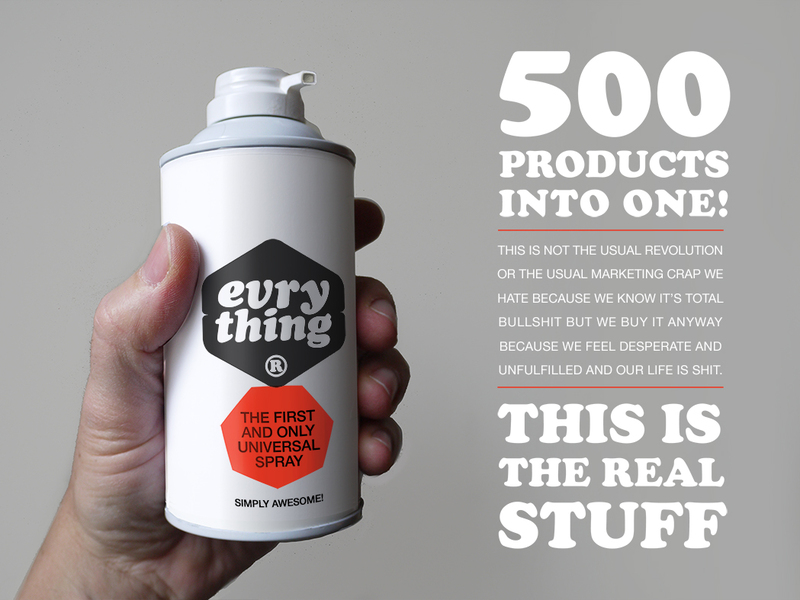 We did it just to be catchy and cool, ’cause nobody is going to buy something called ‘everything’ but he’s ready to spend 9 bucks for EVRYTHING®. You are welcome to go through our presentation and see how we launched our product into market. 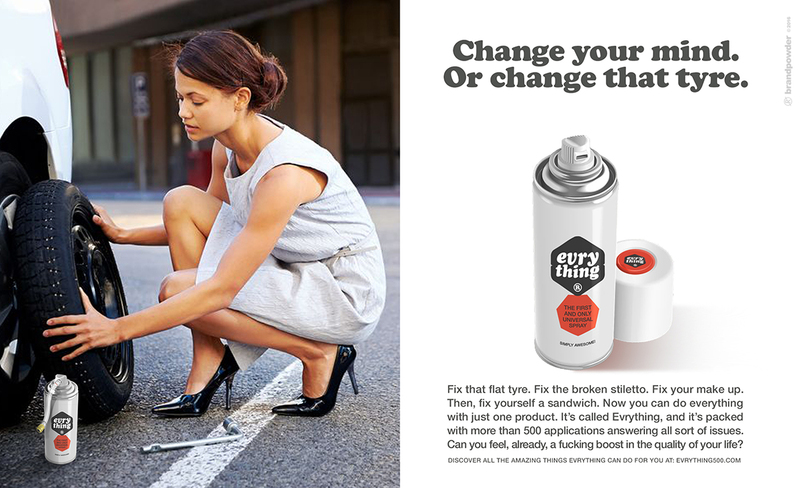 If you are not impressed yet, consider this: one can of EVRYTHING® does everything for you. And we mean it! You can use it as toothpaste, make up, plaster, glue, paint, bath foam, glass cleaner, whipped cream, tyre repair kit, spray foam, filler, fuel, food or body lubricant, just to name a few. 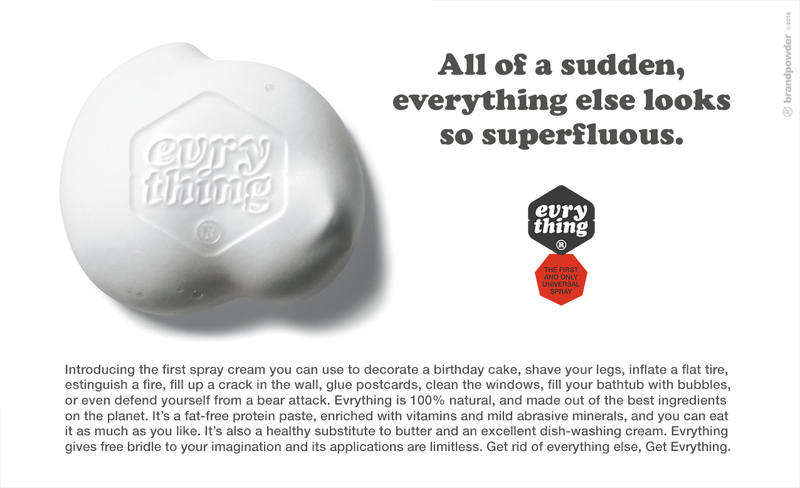 Thanks to our multitasking, powerful invention, you will get rid of everything else because with EVRYTHING® you won’t need anything else. Sold! What a great product. Where can I purchase this? Can I use it as an oven cleaner AND a face cream? I hope so! how are you? Thank you for asking. Yes, of coursem, you can use Evrything® for whatever you want, As an oven cleaner, though, a few picky customers claimed that Splendoven does a better job but we don’t think so. 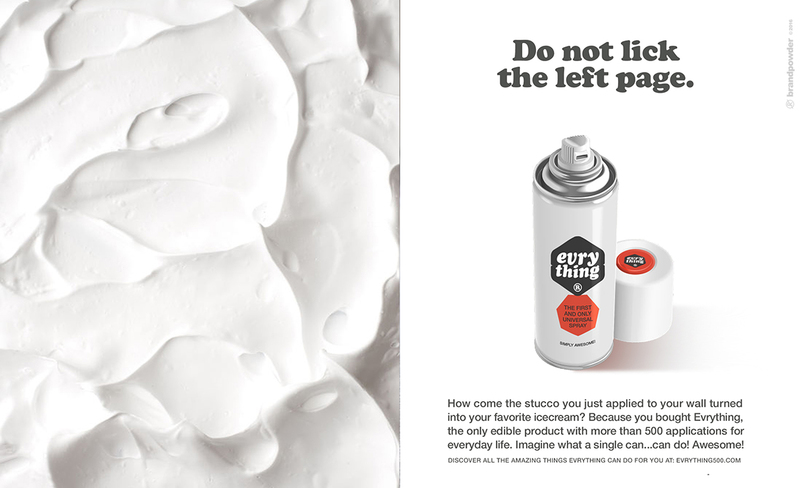 Anyway, our product – due to high demand – is quite hard to find at your nearest shop. Send us one thousand dollars and we’ll ship a 6-pack to your address. Actually, we’ll send you a box for free. Bear hug from the Brandpowder Team. to do is contact the professionals of cleaning. laundry detergents contain toxic chemicals. How interesting! Thank you for writing us.